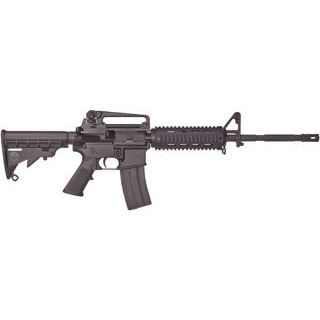 Bushmaster 90831 XM-15 Patrolmans Quad Rail Carbine Semi-Automatic 223 Remington|5.56 NATO 16 30+1 6-Position Black Stk Black in. The Quad Rail Patrolmans Carbine has a 16 4150 chrome molyvanadium barrel. It is chromelined in both bore and chamber with A2 birdcagetype suppressor. The freefloat quad rail foreend increases accuracy and enables accessory mounting. The Patrolmans Quad Rail Carbine utilizes a sixposition telestock for light weight and quick handling."